Most pundits I read claim that the value of sterling has been in a period of ‘uncertainty’ since the ‘surprise’ Brexit vote of 23 June 2016. Usually, when I read the word ‘uncertainty’ in a MSM piece, I translate that as ‘down’, but I am not so sure here. Perhaps they mean ‘volatile’, or ‘direction-less’. Of course, what they really mean is that they didn’t have a clue where it would heading after the vote (since they follow the incorrect ‘news makes the market’ paradigm). If they did, they would proclaim their foresight to the world. Naturally, some cheat and claim they foresaw it when they didn’t, but that’s another story. Yes, the ‘shock’ result did send volatility flying but when the dust settle, it continued its bear trend already in force since the $1.72 high of May 2014 – a full two years prior. So was the result that shocking? Remember, the news follows the market. I would venture that the downtrend would have persisted even if the vote had gone the other way. So all of the hand-wringing by pundits of what Brexit means for the pound is totally pointless – as is most MSM commentary. Note the low made in October 2016 occurred on a strong momentum divergence. And today, after a strong decline off the April 2018 high, we have a very similar setup. In the previous occasion, it resulted in a sharp counter-trend rally. So will history repeat this time? 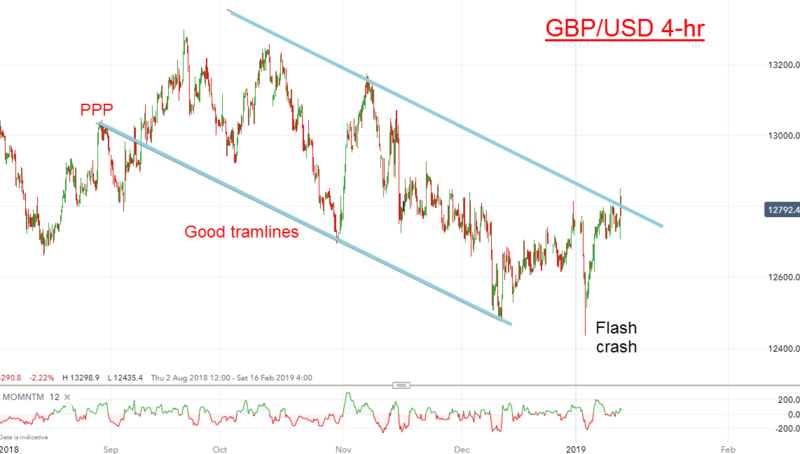 The latest decline into the low has been contained in the trading channel between my tramlines (strictly, the upper line is not a tramline since it has only two touch points). The currencies experienced a shock ‘Flash Crash’ in early January that lasted all of a few hours but the recoveries were very strong. 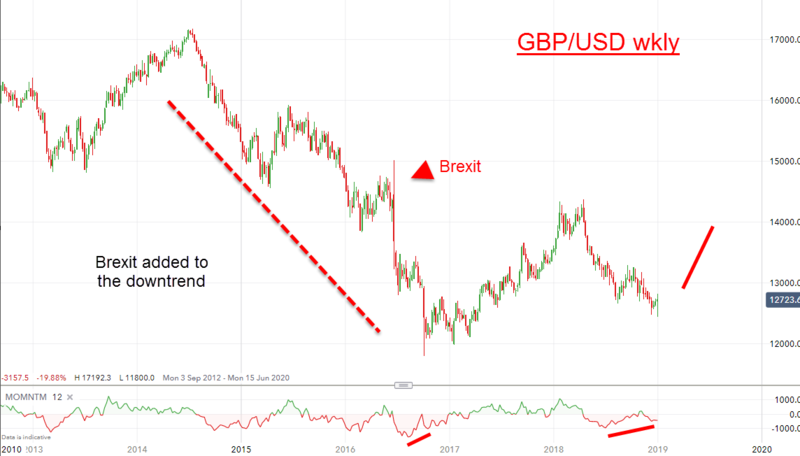 That was a big clue the trends were reversing and sterling would join the party and rally hard – and that is what we are seeing. Yesterday, it tested the upper tramline again – and late in the day pushed through. And here is another ‘news makes the market’ theory gone wrong. I managed to identify the top in the T-Bond market on 3 January and it has fallen by 3.5 handles since then. But only now are we seeing some ‘negative’ news to follow it lower. It was reported that foreign demand for T-Bonds is at the lowest level in two years. The big buyers up till now have been Japan and China but apparently they went on strike in the New Year. The sudden change in policy begs a few questions, such as: With the dollar so high and US debt continuing to balloon, are they getting nervous about Moody’s recent decision to put the USA on a credit watch? There is a lot of talk about using another currency (or basket) as a trading standard in place of the dollar. In fact, the proportion of world trade by the US has been in decline over the years, whereas that of the EU and China has expanded. There is certainly some logic to toppling the dollar off its pedestal. I started trading this commodity last year. The price had been slaughtered as huge stocks and over-production took their toll. In fact, it plumbed the depths of 10 cents/lb which was way under the cost of production for many nations. Brazil and India are the largest producers of cane. Having traded crop commodities before, I knew that the cure for low prices was low prices! It reduces investment in efficient production and eventually many farmers abandon the crop. That sets the scene for a rally in price, especially if weather problems emerge – and that seems to be the setup today with dryness in Brazil. The market then gets wind of a possible big miss to next year’s production and all of a sudden, the massive stocks appear less massive. At today’s low prices, sugar demand is inelastic so a doubling would hardly impact usage. There have been some occasional huge bull runs with the historic run ot 36 cents in 2011 on weather damage. But with the recent decline to 10 cents, that created a potential Double Bottom into solid chart support. Odds were high the market would start turning the corner around there. 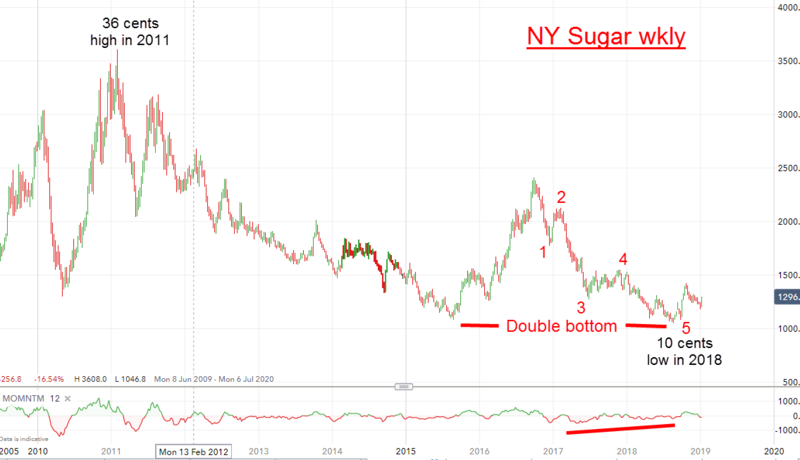 Because sugar has a history of staging very large swings, I wanted to get on board this one. That’s why last year I searched for a high prob/low risk long entry for VIP Traders Club members – and found it! And we rode the rally up to the 13.5 cent region for a tidy gain of 2 cents in about four weeks. That’s a profit of £2,000 at £10 per pip (margin required of £350). Not too shabby. But over the next few months, the consolidation set in. 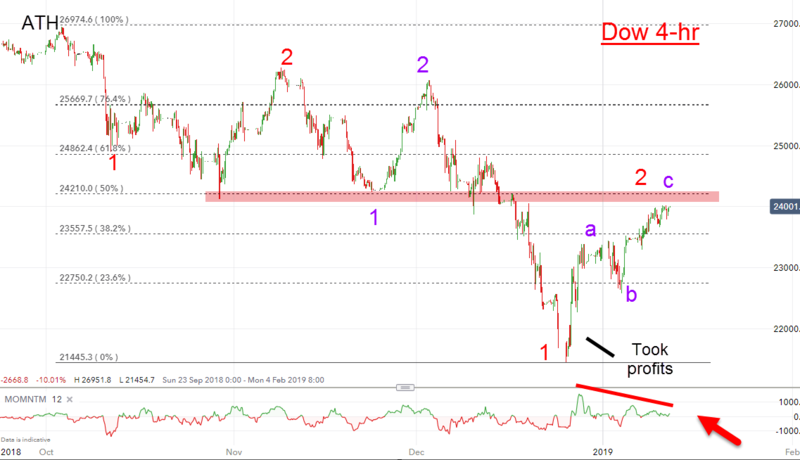 I believed the odds favoured a bear trend in December, but when it hit the Fib 62% support level on an a-b-c three down, I quickly changed my mind! The market then flew up and is now in up mode. Odds are high sugar is starting a major bull run. Of course, extreme weather can play havoc with crops, or it could be benign – we are in the lap of the weather gods. But at least, the downside appears very limited while the upside has much potential. And that is the setup I prefer to trade. Is the stock surge about over? That is the question on most of my members’ lips, judging by the emails I receive! 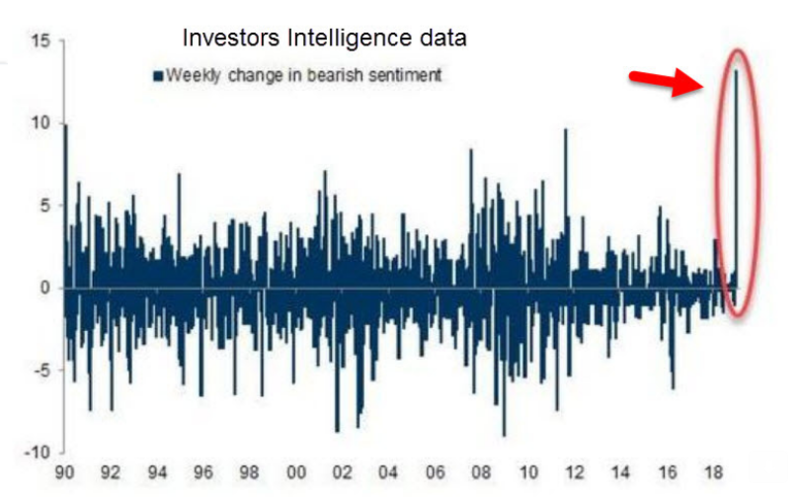 There is no doubt the two-week recovery off the Christmas lows has been very sharp. But that was precisely what I expected as sentiment had become way too bearish in late December. Recall my post of 29 December – Is This a Dead Cat Bounce? 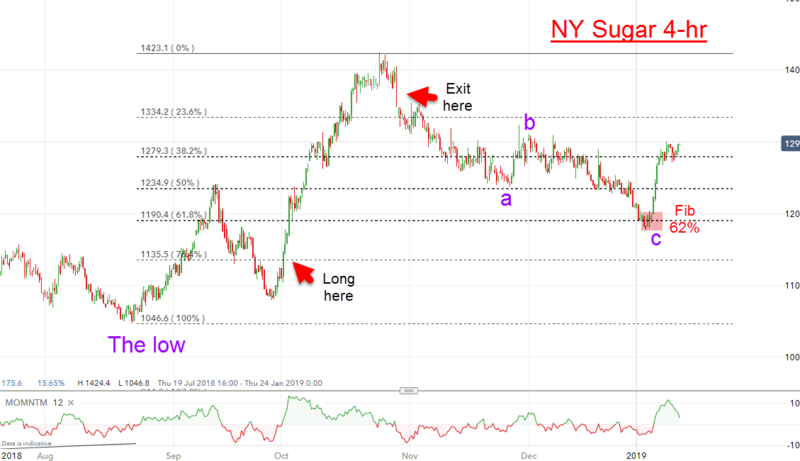 – where I wrote: As it happened, I fully expected that reversal when I sent VIP Traders Club members a note in Monday morning’s Trade Alert to cover some shorts for a huge profit and to look for a rally to the 23,200 – 23,300 zone. As it is turning out my target of the 23,200 – 23,300 zone for the Dow rally was too conservative. Last week’s high was slightly higher at 24,000. But was I in the correct ballpark? At the current 24,000 print, it is approaching the critical pink zone of resistance, which I believe is supremely strong. The rally is in the required three up and the momentum divergence is massive. All of this points to a resolution that is very likely to be extremely violent. I am looking for a suitable entry point that should arrive next week. This is the Investors Intelligence data and the skyscraper on the right is December’s about-face. All of those new shorts are getting their heads handed to them – and are being taught a lesson in market timing! Now they are out of the market, it appears the time is about right to re-enter.